Enjoy true-blue Southern hospitality in Perry, Georgia, while exploring the indoor and outdoor exhibits at FMCA’s 99th International Convention & RV Expo. If you have not yet decided when to unwrap your RV for spring, or leave your snowbird nest, let FMCA tantalize you with this tasty tidbit: the “Peachy In Perry” convention, March 13 through 16, 2019, at the Georgia National Fairgrounds & Agricenter in Perry. 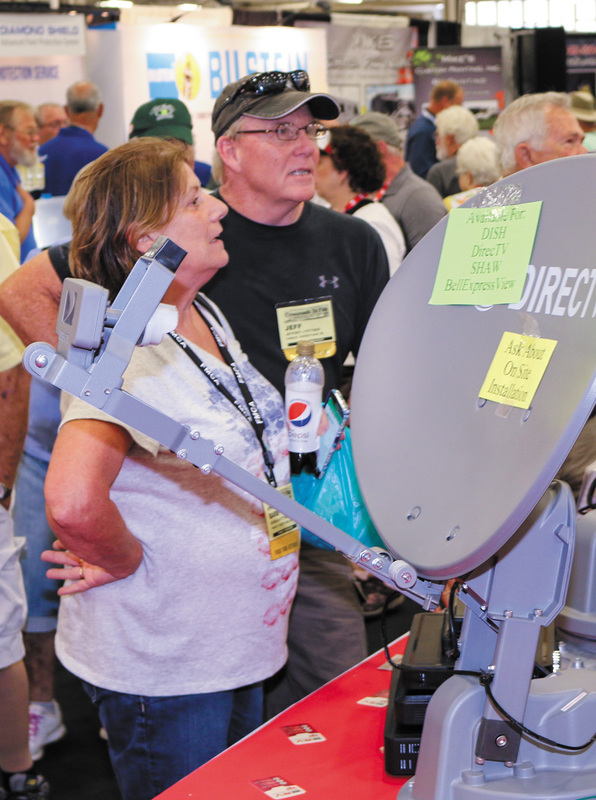 In addition to partaking of seminars, entertainment, and special events during FMCA’s 99th International Convention, attendees will want to browse the RV Expo. That’s where RV manufacturers; RV dealers; and sellers of supplies, services, and components — all designed to enhance the RV experience — will welcome visitors. To whet your appetite, refer to the following list of exhibiting companies, which was accurate at press time. Updates will be provided at FMCA.com, and in the Perry convention app and event program. A Better U — “Smart” coffee to suppress appetite, lose weight, gain energy, increase focus, and enhance clarity. Adventure Caravans — Guided RV tours and rallies. All Seasons Marketing — HepvO sanitary waste valve, which replaces the P-trap and secondary vent in a plumbing system. Alliance Coach Inc. — RVs. Almost Heaven Micro Fiber — Microfiber RV mops, bath sheets, washcloths, drying towels, and kitchen towels; American-made extension poles, squeegees, and wax, etc. Amazing Crystal Glass Nail Files — Crystal nail files. American Booster Inc. — Voltex 50 RV Plus, which boosts mobile signals and increases data speeds for all mobile devices and with all U.S. and Canadian wireless carriers. American Coach — American Coach motorhomes. Americas Mailbox Inc. — Mail forwarding, home base, vehicle registration, insurance, and used vehicle sales. Americus KOA At Brickyard Plantation Golf Club — KOA campground in Americus, Georgia. Apalachee RV Center Inc. — Full-service repair and collision repair shop. Aqua View Inc. — Aqua View Showermiser; conserves fresh-water and gray-water tank capacities up to 40 percent. Ashley DeRamus Foundation — Apparel, jewelry, accessories. BaxMAX — Lightweight, breathable back-support belts; Honey Bee skin cream and other skin care products. Beauty Inspired Concepts — Natural-looking wash-and-wear wigs and accessories. Bentsen Palm/Rhodes Enterprises — Premium RV properties and homes in Retama Village, Mission, Texas. Bio Therapy — TENS units; muscle massages for pain relief. Birdstone Gardens — Wearable art; vintage Blue Fish clothing; silk slippers and accessories; hats; hand-painted shoes; yard flags; Hawaiian tea. Blue Ox — Blue Ox tow bars, base plates, braking systems, hitches, accessories. BnD Flagpole Sales — Titan telescoping commercial flagpoles; U.S., military, boutique flags; flagpole accessories and lighting. Bobee Tech Corporation — RV security camera, dash cam, wireless rearview/backup camera. Boeshield T9/PMS Products Inc. — Boeshield T-9 waterproof lubrication. Boogey Lights — High-intensity RV awning and under-glow LED lighting specifically designed for motorsports applications. Bright Idea RV LED Lights — RV LED lights, LED puck lights, single and double bayonet lights, wedge-based lights, fluorescent lights, awning lights. Briter Products Inc. — FMCA partner; Briter Products’ Ion-Ready lithium-ion phosphate deep-cycle battery. Cabin Bright — 12-volt LED lighting. Cal-Am Properties Inc. — Thirteen Cal-Am Resorts; Montesa, a 55-plus community in Gold Canyon, Arizona. Camco Manufacturing Inc. — Genturi exhaust system; electrical, sanitation, leveling, towing, awning, camping, outdoor, fresh-water and cleaning products; grills; housewares; RV hardware. Campers Inn of Macon-Byron Inc. — Tiffin RVs; Camco and Winegard products. Camping Signs — Hand-painted and personalized camping signs, decals, flags, and shirts. Carefree Of Colorado — Carefree of Colorado RV awnings and accessories. Centramatic On Board Balancers — Permanent on-board tire and wheel balancers. Chandler Specialties — TankTechs Rx black- and gray-water tank solution. Chic Style By Lady G — Clothes, necklaces, scarves, shawls, dresses, jewelry, books, vases, CBD oil. Classic Scent/Classic Design — Ladies’ handbags, RV accessories, designer T-shirts, cell phone bags and accessories, backpacks. Clean Living Solutions — Kanbara Products for clean air naturally and organically; stops odors and kills mold and bacterial growth for cleaner living spaces. Coachcraft By MacDonald — Full RV service and renovation. Coastal Georgia RV Resort — Information for Brunswick, Georgia, RV resort. Crossing Creeks RV Resort — Information for resort near Blairsville, Georgia. Custom Glass Solutions By Guardian — FMCA member benefit; Guardian’s RV Glass Network windshield replacement services and one year of FMCA membership for free. Cutco Cutlery — Household cutlery, culinary tools, barbecue and garden tools, cookware, flatware, sporting and hunting knives, scissors, accessories. Day Brothers RV Auto/RV Sales LLC — Locations in London, Kentucky, and Lake Park, Georgia; offers all RV types, including brands by American Coach, Entegra, Monaco, Holiday Rambler, Fleetwood, Winnebago, Forest River, Grand Design, and Heartland. Deer Creek Motorcoach Resort — Resident-owned Type A RV resort on the Blue Ridge Parkway. Diamond Shield — RV paint-protection film; nationwide mobile service; OEM, dealer, and consumer installation, removal, and replacement; precut vehicle kits; bulk film distribution. Dometic Corporation — Dometic CFX powered coolers, in a wide range of sizes. Dom’s Sunglasses — Various sizes and shapes of polarized fit-over sunglasses for prescription glasses. Doterra Essential Oils — Essential oils, supplements, and natural cleaning products. Dotty’s Design — Beaded jewelry, necklaces, bracelets, earrings, lanyards, and medical bracelet bands. Elizabeth Truck Center — Full collision repair facility; 24/7 towing; fabrication of hard-to-find parts; fiberglass repairs; roof repair; full paint jobs. Entegra Coach Inc. — Entegra motorhomes. European Motorhome Tours — Escorted RV tours through Europe and the British Isles; fully equipped rental RV included; new itineraries to include Germany, Italy, Austria, Switzerland, France, Spain, Scandinavia, Greece, England, Scotland, Ireland, etc. Euroshine USA Inc. — Euro Scooters personal adult scooter; Euro Body Shapers all-in-one exercise machines; EZX Streaming media player. Evelo Electric Bicycles — Easy-to-ride, easy-to-transport e-bikes. Fanelli — Fanelli decorative jewelry: snap buttons and beads. Fantasy RV Tours — FMCA club-discounted and member-only RV caravans and rallies. Flitz International Ltd. — Flitz polishes, sealant, waxes, cleaners, protectant, buffers, and microfibers. Florida RVs LLC — Sales, service, and parts; Keystone Springdale, Sprinter, Raptor, Carbon, Alpine, Avalanche, Bullet, Premier and Residence; Heartland Milestone; Cruiser RV Shadow Cruiser; Thor Motor Coach Four Winds. FMCA — Membership and member benefits, dues renewals, FMCA merchandise, FMCA road atlas, area rally information. FMCA Health Plan — FMCA Health Plan benefits exclusively for FMCA members, Medicare supplement plans, dental insurance, long-term care insurance. Foot Pharmacy Direct — Custom orthotics and arch supports. Frans Enterprise — Gripstic sliding bag sealer for pantry, fridge, and freezer. Freightliner Custom Chassis Corporation — Freightliner Custom Chassis. Gadget & Game Depot — As Seen On TV board, card, and dice games; card shufflers and holders; Jumbo Sequence and dominoes. General RV Center — REV Group RVs. Girard Systems — Awnings, shade products, powered TV boxes, On Demand tankless water heaters. Griot’s Garage Inc. — Griot’s Garage liquid car care products made in the USA. HWH Corporation — HWH Hydraulic Leveling Systems, HWH Slide-Out Systems, HWH Active Air Suspension System, HWH Specialty Oil, and HWH Hydraulic Entry Steps. Hale Northeastern — Convention decorating services. Happy Campers Holding Tank Treatment — Happy Campers organic, odorless, environmentally friendly, long-lasting holding tank treatment; designed to work in extreme temperatures. Henderson’s Line-Up, Brake & RV — Products to improve RV drivability, including Trac Bars, bell cranks, motion control units (MCU), quad shock kits, shocks, Safe-T-Plus steering stabilizers, Roadmaster products, coil springs, trim control units. Heritage Motor Coach Resort & Marina — Luxury RV resort with its own marina in Orange Beach, Alabama. Howes Lubricator — Diesel fuel additives containing no alcohol or harmful solvents. JBT & Associates Inc. — Computer support/help while on the road; SafeGuard remote proactive computer assistance program; virus protection, defrag, OS updates, help desk, pop-up help, etc. JD Solutions LLC — The Sewer Saddle Bag. Jupiter Tech — Folding electric bikes made specifically to fit into RV storage spaces. Lake Osprey RV Country Club — Active adult community in Elberta, Alabama; one of six luxury Roberts Resorts. Lakewood Camping Resort — Oceanfront campground in Myrtle Beach, South Carolina. Lance Camper Manufacturing Corporation/REV Group — Lance Campers. Lazydays — New and used RVs, including Tiffin RVs. LeafFilter North Of Georgia LLC — LeafFilter Gutter Protection. Liberty Coach Inc. — Liberty Coach Prevost motorhome. LiquidSpring LLC — Liquid Spring CLASS suspension. Lloyd DeGerald Services-Aqua Hot Services — Aqua-Hot service, repair, parts, and education. Lots Of Lights — Custom-made light available in 30 colors and prints, three sizes, nine shapes; includes a 12-foot cord, cool light LED bulb, and LED bulb with remote. L’Paige Cosmetics — L’Paige Lipstick and cosmetics; Worley’s Wonder jewelry cleaner; battery-operated massage pillows. M&E Sales — Electric scooters, vibration exercise machines, outdoor patio umbrellas. Magne Shade By Hunckler Fabrication — Custom magnetic windshield shades and tire covers. Master Tech Custom Coach RV & Marine — Furniture, flooring, RV customizing, cabinetry, electronics, Aqua-Hot service, lithium batteries, MCD shades, Birds Eye Camera system, GPS navigation systems, Under Armor protection, Invincible Roof, SilverLeaf Electronics. Michelin North America Inc. — Advantage program pricing on Michelin RV, truck, and auto tires. Microair Inc. — EasyStart soft starter for single-phase motors operating at 115-240 volts AC/50 to 60 hertz; allows starting an air conditioner on a limited power source, such as a generator, inverter, or reduced utility hookup. Microwave Connection — Recipes, cookware, and information for using a microwave-convection oven. Minot Convention & Visitors Bureau — Information about lodging, restaurants, and things to do in the Minot, North Dakota, area. Mission Builders — Recruiting construction volunteers for ELCA Mission Builders Ministry, which builds structures, community, and faith by helping congregations and camps construct their own facilities. Mobileye Inc. — Mobileye Collision Avoidance System, which performs advanced driver scene interpretations and warns drivers with simple visual and audible alerts. Mobility Scooters Of South Florida Inc. — Sales and rentals of electric mobility scooters. MyPillow Inc. — Bed pillows, utility pillows, pillowcases, mattress toppers, pet beds, Giza 88 sheets. National Indoor RV Centers — Entegra RVs. North Dakota State Fair — Information about exploring North Dakota, including North Dakota Heritage Center, International Peace Garden, Medora, and Badlands beauty. North Dakota Tourism — Information about North Dakota cities, landscapes, outdoor adventures, historic figures, and Theodore Roosevelt National Park. On The Go Products — LED lights and fixtures, Picnic Pals, RV Cable Grip, RoadMate dash cam, grill mats, RV supplies, filters. Origins Unveiled — Flip-Pal mobile scanner to digitize family photos, documents, receipts, coins, and medals; Pando family history game; MyHeritage DNA test kits. Palm Beach Motorcoach Resort — Southeast Florida luxury motor coach resort. Passport America — 50 percent discount camping card and international camping directory. Pet Creations Corporation — Custom pet harnesses, dresses, and collars. Phoenix USA Inc. — Phoenix Cruiser B+ and TRX Transit B+ motorhomes. Precise Satellite/RV Electronics — Winegard and RF Mogul RV satellite TV systems; SMI tow braking systems. Progressive Insurance — Insurance services. Queen Of Pain Relief — All-natural pain relief product that works quickly and lasts for hours. Recreational Specialties/New Debut — RV customization and restoration. Renegade/Kibbi Inc. — Super C motorhomes, including Vienna, Vera Cruz, Valencia, and Verona. REV Recreation Group — Type A RVs, including Fleetwood, Holiday Rambler, and American Coach. RF Mogul — Manufacturer of RV HD satellite systems. Roadmaster Inc. — Tow bars, brakes, and suspensions. RV Cable Grip/J Wright Concepts — RV Cable Grips, Hose-Grips, all-aluminum RV drawers, watertight water hoses. RV Country — Preowned diesel motorhomes. RV Fog Dr. — Custom painting; RV window repair and replacement. RV Glass Solutions — On-site windshield repair and replacement with nationwide warranty. RV Innovations — Auxiliary braking systems for towed vehicles and accessories. RV LED Lites — Motion-Guard and Starlights motion lighting; Bug-Guard porch lighting; Glow-Tubes fluorescent tube replacements; LED replacements; Naked-Bulbs and Stacker-Bulbs. RV One Superstores Inc. — Entegra RVs. RV Roofing Solutions — Liquid acrylic for all RV roofs, with a 17-year lifespan; maintenance-free. RV Safety & Education Foundation — RV weighing by individual wheel position. RV Safety Accessories Inc. — TireTraker tire pressure monitoring systems and Progressive Industries surge and voltage protectors, all with lifetime warranties. RVForce LLC — Mobile RV repairs, upgrades, maintenance, and care. Satellite Electronics/RV Connections — DirecTV and Dish independent dealer; TV and custom sound systems; Winegard satellite and TV connections and accessories; satellite service for KVH, MotoSat, Kingdome, and TracVision; servicing off-air antenna issues and audio-video systems. Seven Corners Inc. — International travel insurance and specialty benefits management company; administers FMCAssist member benefit. ShadePro Inc. — Carefree awnings; Demco towing products; Winegard and Vista Shade products; dash covers. SilverLeaf Electronics — SilverLeaf vehicle instrumentation systems. Slidemaster/Innovative Industries — Custom-built aluminum or steel cargo-handling slides and trays for RVs, pickup trucks, SUVs, etc. ; various extensions and weight capacities; electrically powered slides for ease of use. Smoky Mountain Coach Works — RV renovations, including MCD blinds, flooring, appliances, reupholstery, furniture, LED lighting, custom cabinets and counters, electronics, UHD TV, internet, smartphone technology, new advanced lithium-ion power systems, lifetime-guaranteed RV roofs. Solar Energy Systems — RV solar system installation; solar inverters, inverter repair, new batteries. Southland RV — Lance, Airstream, NeXus RV, Leisure Travel Vans. Steer Safe Inc. — RV steering stabilizers for better control and less fatigue. Stone Vos LLC — Manufacturer of replacement fabric for RV awnings. Streak Free — Streak Free cleaning cloths. Summit Products — RV stainless accessories, chrome latches, jack pads. Superior Driveline — Driveshaft disconnects for towing rear-wheel-drive and four-wheel-drive vehicles behind an RV on all four wheels. Superior Sleep Experience — Gel-top adjustable beds. Sweet Caroline’s — Ladies’ boutique clothing, Ruby Ribbon shapewear. Tailgater Tire Table — Durable steel travel table that uses an RV or other vehicle tire for its main support, with no tools required for installation. Techno RV — TST tire-pressure monitoring systems, Surge Guard electrical protection systems, Rand McNally RV GPS, WeBoost cell boosters, Wi-Fi boosters, etc. The Gardens RV Village — Eastern Tennessee RV community of custom-designed luxury homes with attached, fully enclosed RV garages. The Great Outdoors RV Resort — Smoky Mountains resort located in a wooded setting, with mountain-range views, easy access, and big-rig sites. Thetford & Norcold Corporation — RV toilets, chemical and care products, evacuation systems. Tiffin Motorhomes Inc. — Full line of Tiffin RVs. TireMinder Minder Research — TireMinder tire-pressure monitoring system; TempMinder wireless temperature monitor. TNR Group — Portable medical devices with TENS/EMS technology for pain relief or massage therapy; therapeutic jewelry made of stainless steel, silicone, and titanium with magnets, mineral frequency, and negative ions for pain relief. Trikaroo Inc. — Trikaroo golf cart alternative that is ADA-compliant; street legal; and seats two people, one behind the other. Uncommon USA Inc. — The Original Telescoping Flagpole; flags; RV stands; light kits; flagpole accessories, etc. United Safety Apparatus Inc. — Safe-T-Plus steering control, which reduces road wander caused by side winds, uneven pavement, and passing tractor trailers and trucks; helps handle front-tire blowouts; assists with ruts, bumps, uneven pavement, and potholes. United States Warranty Corporation — Service contracts for new and used (up to 23 years old) RVs. Valley River RV Resort — Luxury North Carolina RV resort located in the heart of the Great Smoky Mountains, across from Harrah’s Valley River Casino. Vertiyak — Vertical hitch-mount carrier for most recreational kayaks or paddle boards up to 12 feet in length; mounts into a 2-inch hitch receiver. Wash Wax All — Waterless wash, wax, bug removal from the ground with no ladder needed. Webster Enterprises — Perfect wine opener; HexClad cookware; Tumerix dietary supplement; Casada massager; TV streaming box; foot massager; Triad Aer air purifier; and flat stack containers. Wood Design RV Interiors LLC — Custom-built wood products and cabinets for RVs. Your Best Address — FMCA mail forwarding, mail, and vehicle registration services provider. YTM Enterprises — Skin care by Celestolite, Elevare, LED, Cocoage, Predire Paris, Bionyx, and Vine Vera.